Problem: Customer was looking for a unit cost reduction, and also was incurring high freight costs. 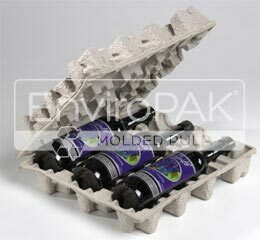 Solution: A set of molded pulp end caps were developed, which provided for significant cost savings and since the end caps are nest-able, we were able to nearly triple the amount of product on a pallet which resulted in lower freight cost per unit. Problem: Customer was experiencing excessive UPS shipping damage, incurred high freight costs and had limited storage space. Solution: A custom 3 pack molded pulp tray was developed, which resulted in greatly reduced shipping damage. 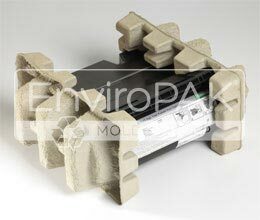 In addition, since the molded pulp trays are nest-able, a substantial decrease in freight cost per unit was achieved, and minimal storage space was required on-line and in warehouse to meet the customer’s production schedule.